This Tuesday: Pre-High Holiday Class! Join us for a insightful & inspiring pre-High Holiday class! In "Dawn of a New Year" we will explore several insights drawn from Kabbalah and Chassidus that are sure to add meaning to your Rosh Hashana and Yom Kippur experience! Holiday Dinner: Did you Reserve Yet? 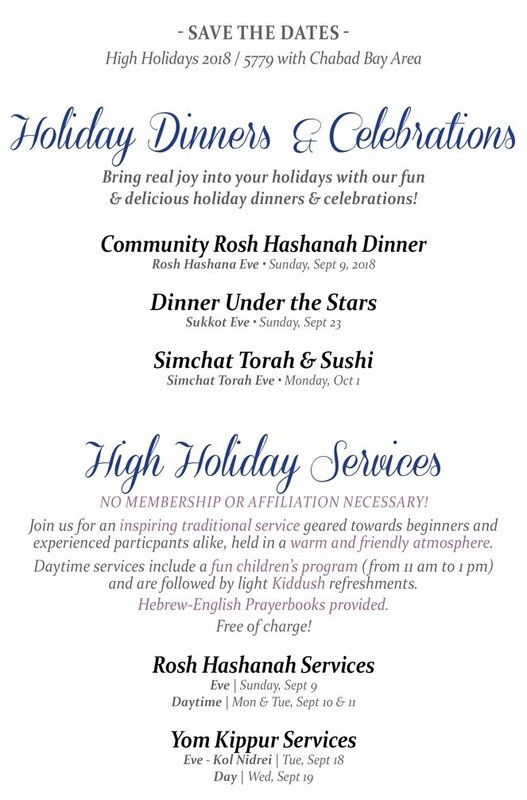 RSVP for the Community Rosh Hashanah Dinner! Joins us for a delicious, full course holiday dinner! Advance reservations are required. Invite your friends to join you! This Week: Dedicate DATE or place AD in Calendar! Please submit your info this week. Be part of the Bay Area Jewish Calendar! The Bay Area Jewish Calendar is the only one of its kind! It is mailed free to Jewish homes and businesses in the Bay Area. It includes holiday and Shabbat info with candle lighting times and lots of helpful info for Jewish life! Get inspired and geared up with all you need to know at our free pre-High Holiday class on Tuesday, September 4, 2018 at 7:30 pm. Summertime and the weeks leading up to the High Holidays are a great time to do some spiritual home improvement! We currently have some new Kosher Mezuzah scrolls in stock. It is important for every Jewish home (and business) to have good Kosher Mezuzot on its doors. In addition to fulfilling this very special Mitzvah, authentic Kosher Mezuzot also serve as a spiritual protection for your home and family in health, safety and livelihood. Often Mezuzah cases are sold in stores with sample inserts that are not genuine Mezuzot, or sometimes a hand-written scroll may have been written very poorly and does not meet the requirements of an authentic Kosher Mezuzah. 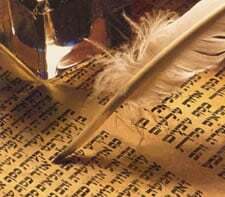 A real Mezuzah is a holy object (akin to a Torah Scroll) written with great care by an expert, G-d fearing scribe to exacting standards and keeping to the guidelines and rules passed on since the days of Moses. Not sure? Just call Rabbi Yitzchok Schmukler. He will be happy to have a look for you or even do a free housecall. Contact the rabbi: rabbi@jbayarea.org or 281-724-1522. "Courageous, fascinating and inspiring" - That's how one of the participants described Mark Halawa's talk delivered to a packed house at Chabad Bay Area on July 31st. In his talk "Am I My Own Enemy?" Mark shared how we went from being raised Muslim in Kuwait to now living as a proud Jew in Jerusalem, and of his work towards increasing tolerance and understanding in the Arab world. Click here to see the full PHOTO ALBUM!